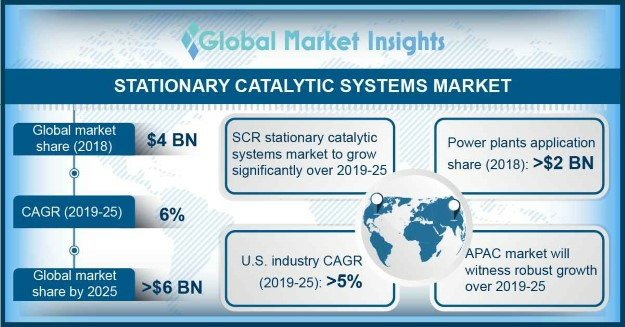 Stationary Catalytic Systems Market size is set to surpass USD 6 billion by 2025, as reported in the latest study by Global Market Insights, Inc.
Increasing nitrogen emissions from power plants and other industrial applications along with the growing concerns toward its adverse effects on environment and human health will complement the stationary catalytic systems market growth. The EPA introduced regulations under National Ambient Air Quality Standards (NAAQS) with an aim to limit nitrogen emissions from boilers and gas turbines. Rising concerns pertaining NOx emissions along with stringent legislative norms is anticipated to encourage the adoption of Selective Catalytic Reduction Systems (SCRs) & oxidation catalyst.